Yvaine is a triangular shawl, which is knit from the top to the bottom point with increases on every right side row. I was able to knit the shawl using the row combinations below using one ball of Handmaiden Fine Yarns Casbah Sock. 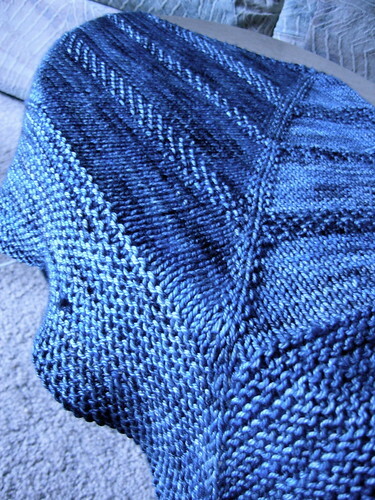 It’s a very simple construction: garter stitch border, 3 panels of seed stitch, and ending in garter stitch. I suppose you could just use garter stitch throughout, but I opted for seed stitch to give it a slightly more subtle texture than garter stitch usually provides. 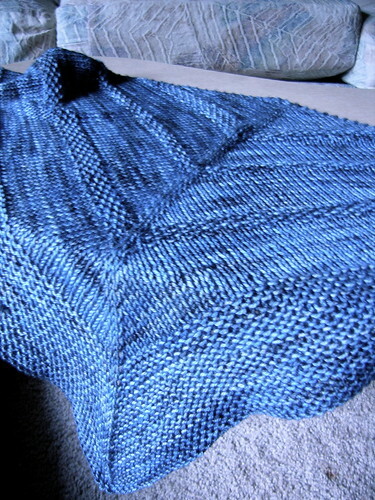 I blocked my shawl, and it nearly doubled in size. 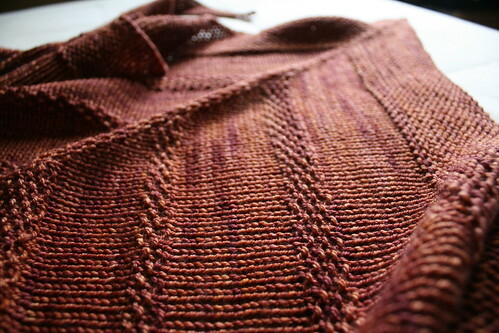 Blocking is, of course, optional with a project like this, but I’d recommend it. This is a great portable project. It was one of those things I could just put down and do whatever, whenever. I finished it rather quickly, considering its size. Finished measurements after block were 45″ wingspan, and 20″ from cast on edge to bottom tip. This shawl is named after Yvaine, the star from Neil Gaiman’s novel Stardust. I felt it was an appropriate name for the pattern.